The Nightly Show with Larry Wilmore is an American late-night panel talk show hosted by Larry Wilmore. 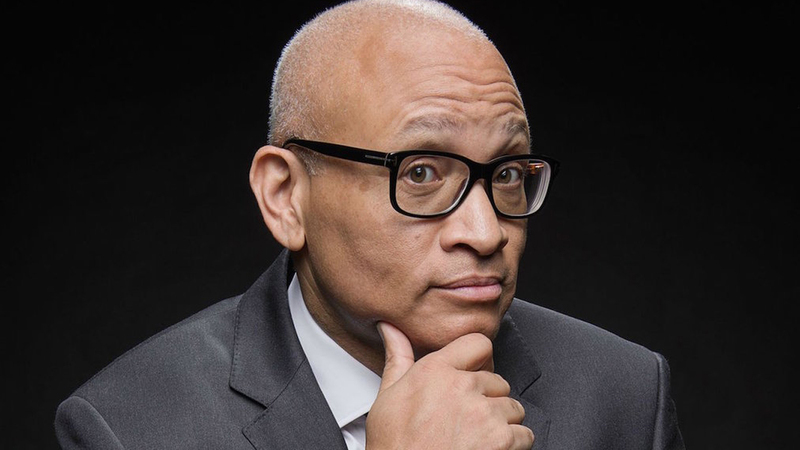 The Nightly Show with Larry Wilmore is a spin-off of The Daily Show, which featured Wilmore as a recurring contributor billed as the "Senior Black Correspondent". It premiered on January 19, 2015 on Comedy Central, and airs Mondays through Thursdays at 11:30 PM (EST) following The Daily Show. It serves as a replacement for The Colbert Report, which aired in the same time-slot from October 2005 until December 2014. The show has been described as a combination of The Daily Show and Politically Incorrect. Each episode begins with Wilmore's scripted take on the news followed by a panel discussion with his guests. Critics slam the president for shedding tears during a speech on gun control, and Larry examines the media's role in violence with Wesley Morris, Ricky Velez and Robin Thede. Larry talks about the Disneyland measles epidemic and the fight against vaccines with panelists Holly Phillips, Judy Gold, Zoey O'Toole and Mike Yard. An armed militia group occupies a federal wildlife refuge in Oregon, and Larry discusses the arrest of Bill Cosby with Franchesca Ramsey, Mike Yard and Holly Walker. Republican presidential hopefuls debate foreign policy, and Larry discusses Serena Williams's Sportsperson of the Year award with T-Pain, Holly Walker and Grace Parra. Chicago Mayor Rahm Emanuel fires his police chief over the shooting death of a black teen, and Larry discusses colorblind casting with Spike Lee, Rory Albanese and Mike Yard. GOP presidential hopeful Rand Paul chats about Donald Trump over soul food, and Bob Saget, Ana Kasparian and Mike Yard discuss cringe-worthy Halloween costumes. North Korea's Kim Jong-un claims to have tested a hydrogen bomb, and Larry talks about Silicon Valley's crime-fighting robots with Hank Azaria, Mike Yard and Rory Albanese. Bill Cosby sues seven of his accusers for defamation, and Larry discusses a historically realistic portrait of Jesus Christ with Taye Diggs, Rory Albanese and Robin Thede.